Hats off to all the colored pencil artists in the world. Their patience! They amaze me. 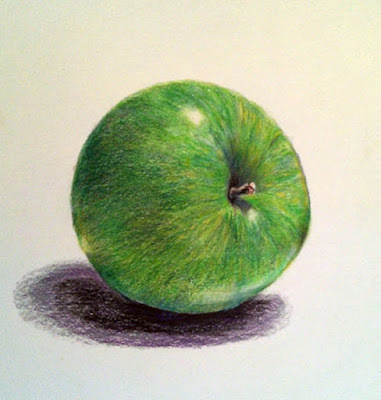 This colored pencil drawing of a green Granny Smith. I thought the two would make a good match and I think they did. I wanted more of the small lighter colored circles and ovals in the apple, but somehow I lost them in the process. All-in-all a good experiment.